What time is it? It's CHUMBY TIME! Chumby has still to make a dent in the Euro gadget market, but the craze picks up pace in the US this month, with the company announcing a bunch of new digi photo frame widgets. 2009 is all about the Widgets, it seems, going from the amount of time we've heard the word at CES this year! Not one to miss out, Chumby is set to produce a range of digital photo frames with up to 1000 constantly updated widgets, covering a multitude of categores including news, weather, cooking, entertainment and more. If you can imagine an RSS feed, then Chumby's Widgets are the same. Just with more pictures instead of only boring old words. "Chumby offers a complete solution for delivering the best of the Internet to consumer devices, and we are delighted to reveal our plans to the consumer electronics industry for the first time at CES." 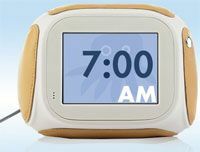 We cannot wait for the new Chumby frames to appear in Europe, although we fear we may have to. TechRadar has contacted the company for more information on plans to finally release the little fellas over in the UK. For more check out Chumby's site.